Air on the G String is a charming slow dance from Bach’s Suite no. 3 in D major BWV 1068. This popular tune was used in the 1980s on the TV advert for Hamlet. When the Pope visited Ireland in September 1979, words were set to ‘Ag Críost an Síol’ in honour of his presence. It is a beautiful, lilting religious Air and is very popular at Irish weddings and funerals. Ave Maria - Latin for Hail Mary - is in a collection of songs Schubert wrote for the poem, “Lady of the Lake”, an Anthurian tale written by Sir Walter Scott. Although the piece begins with the words ‘Ave Maria’, Schubert’s song is not based on a conventional Ave Maria prayer. She Moved Through the Fair is a traditional Irish folk song. Collected in 1909 in Donegal by Padraic Colum and Hebert Hughes, this tune dates back to medieval times. This folk song was featured in the film, ‘Michael Collins’. Gabriel’s Oboe is from the soundtrack of the film, The Mission, composed in 1986. In 1999, Sarah Brightman was given permission by Ennio Morricone to release a vocal version of the piece, ‘Nella Fantasia’. Turlough OCarolan is perhaps Ireland’s most renowned harpist of the 17th and 18th century. He toured the country composing music for Ireland’s aristocracy. Carolan’s welcome Is a personal favourite of Aislings. Panis Angelicus is a religious hymn, composed in the 13th century by Saint Thomas Aquinas. This was arranged by César Franck in 1872 for tenor, organ, harp, cello and double bass. Canon in D is Johann Pachelbel’s greatest known work. Composed during the Baroque period for three violins and continuo, it was not discovered until the 1920s. As is it extremely popular at weddings, it is no surprise that this tune is featured in the film ‘Father of the Bride’. Pie Jesu is usually included in the Requiem Mass. Meaning ‘Kind Jesus' it is a motet copied from the last verse of the Dies Iraes. Andrew Lloyd Webber has received much international acclaim for his Requiem, with his version of Pie Jesu attaining extreme popularity as a separate piece. Maria Von Paradis, a blind Austrian pianist and a friend of Mozart’s is one of the most famous female composers. Composed in the late eighteenth century, Sicilienne is a charming little slow movement originally written for violin and piano. Summertime has been recorded by some of the greatest artists ever lived such as Bing Crosby, Billie Holiday and Ella Fitzgerald. Written in 1935 for the opera ‘Porgy and Bess’, George Gershwin based this famous jazz song on a lullaby from Ukraine. ‘Por Una Cabeza’ is well-known for being featured in the film, ‘Scent of a Woman’. Carlos Gardel composed this popular Spanish tango in 1935, which tells the story of how a man with gambling tendancies makes comparisons with his desire for women and with his addiction to horses. All tracks recorded at Jealoustown Studios, county Meath, Ireland on 15th and 16th April and 20th May, 2009. 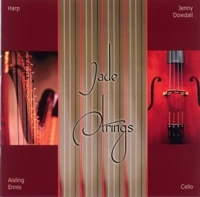 Jade Strings would like to thank their family and friends for all their support over the years.